The Phrozen Transform is a new resin 3D printer that has been generating a ton of buzz on Kickstarter. It boasts interchangeable 13.3” & dual 5.5" panels and an ultra-stable 40 cm Z-axis. Review the specs here. 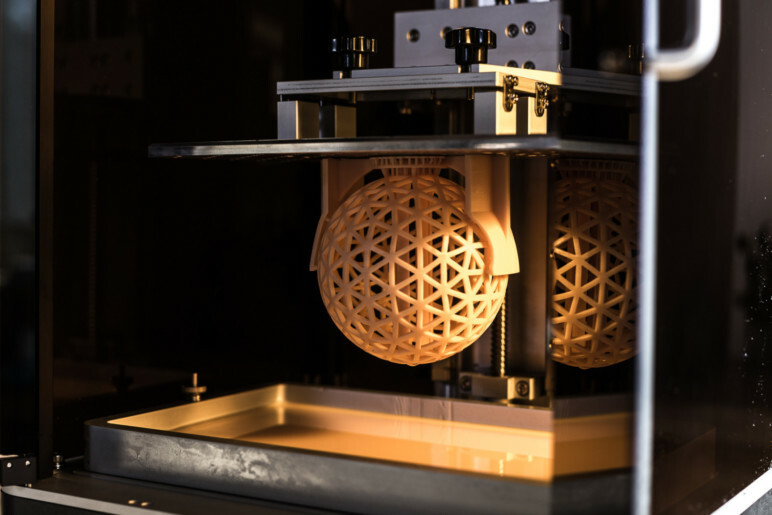 Following in the footsteps of FDM technology, there has been a steady and sticky rise of low-cost desktop resin 3D printers emerging on the budget 3D printing market. 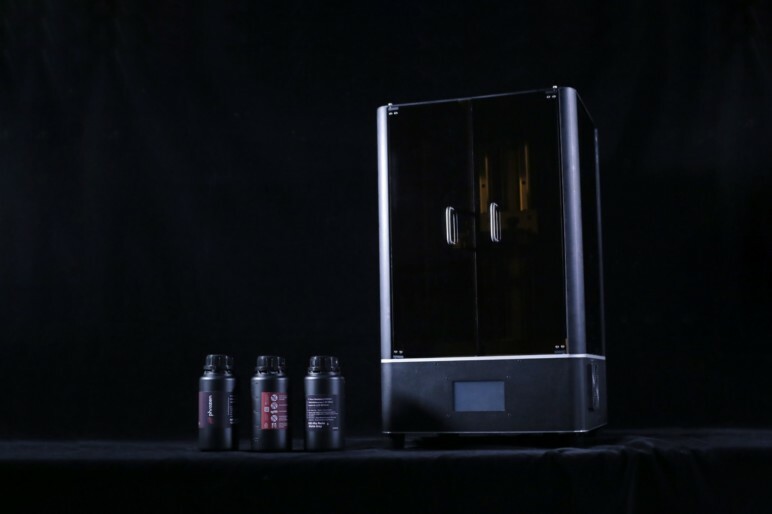 Previously, this space was primarily occupied by the likes of Formlabs, but that has quickly changed as manufacturers have figured out how to recreate the SLA and DLP processes in a more affordable way. How? By using LCD technology, a process that is nearly identical to DLP in that it utilizes projected light to solidify resin layer-by-layer until to create a 3D object. 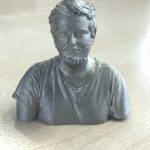 However, the main difference is that LCD 3D printers use a bank of UV LEDs to project light through a mask of the layer on an LCD panel, whereas DLP 3D printers utilize an array of micro-mirrors to selectively project light to create a mask. Pioneered by the popular Anycubic Photon, there is a growing number of cheap resin 3D printers available for frugally-minded makers. One of the most successful is the Taiwanese-based 3D printing company Phrozen. Since its founding in 2013, the manufacturer has released a number of resin 3D printers, including the Phrozen Make, Phrozen Shuffle, and the larger Phrozen Shuffle XL (which we had a joyous time reviewing at the All3DP office). 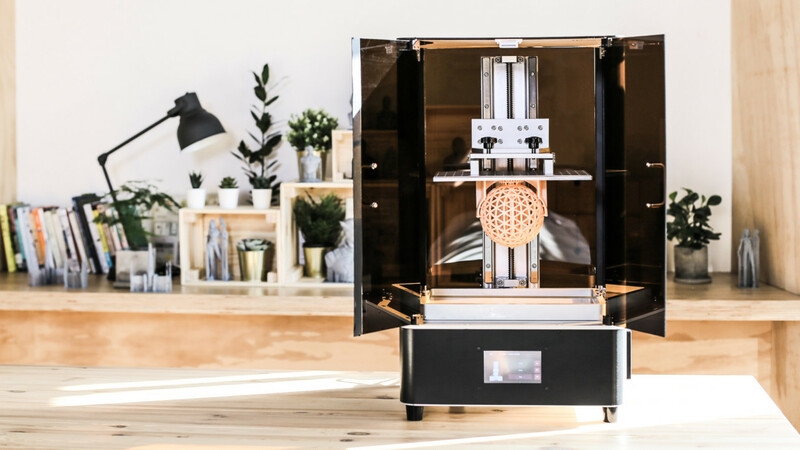 Now, the 3D printer manufacturer has returned to the crowdfunding platform Kickstarter to jumpstart production on its latest machine: the Phrozen Transform. The Phrozen Transform is distinct from most LCD 3D printers we’ve come to know. It has interchangeable 13.3” & dual 5.5″ panels, which enables users to double production output, and an ultra-stable 40 cm Z-axis that allows for sizable prints. After wrapping up its Kickstarter campaign with a whopping $375,823 (out of $30,000) in crowdfunding, it’s clear that a portion of the 3D printing community is excited about the prospect of this unique 3D printer. Let’s review the features and specs to figure out whether or not the Phrozen Transform is worth the hype. Marketed by the manufacturer as an “LCD SLA printer,” this technically inaccurate term is likely to ruffle the feathers of some stern makers. The Phrozen Transform does not employ SLA technology, a well-documented 3D printing technique that utilizes a high-powered laser to solidify the resin instead of projected light. Nevertheless, if you’re able to get past the questionable marketing ploy, the Transform presents some intriguing features that could usher in a new era for resin 3D printing. As we mentioned in the introduction, the hallmark feature of the Phrozen Transform is its swappable 13.3” panel & dual 5.5″ panels. This allows users to print on two different plates simultaneously, effectively cutting print times in half. While most LCD and DLP 3D printers are confined to a single-size panel, the ability to switch between these two configurations makes the Phrozen Transform vastly different from other resin 3D printers we’ve seen on the budget market. Moreover, the manufacturer claims that the printer is equipped with a “Fast LCD Adaptor”, allowing the panels to be swapped out in just 30 seconds. Users will be able to use a larger build volume with the 13.3″ panel, or double output by utilizing the dual panel design, which is ideal for making fine detailed models like jewelry. The Phrozen Transform also has a 40cm Z-axis that makes it possible to print towering objects that are taller than a two-liter bottle of soda. This is also made possible by the sizable 13.3″ panel, a major increase over the market standard for LCD 3D printers, which the manufacturer claims is typically around 8.9″. All in all, the Transform will offer a 29.2 x 16.5 x 40 cm3 build volume. Outside of the dual panel capabilities and impressive print area, the Phrozen Transform is also designed to be highly efficient and accurate. In regard to print quality, Phrozen claims that its new machine provides an XY resolution of 76μm with the 13.3″ panel and an even better 47μm resolution when utilizing the dual panel setup. 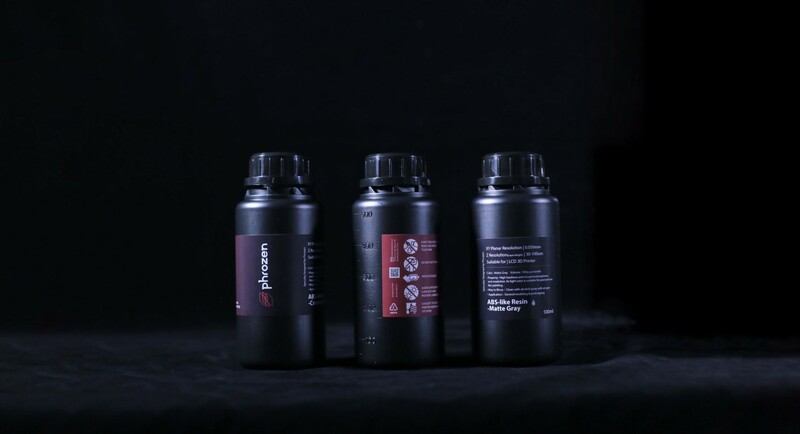 Stability and durability are also key aspects of the Phrozen Transform. 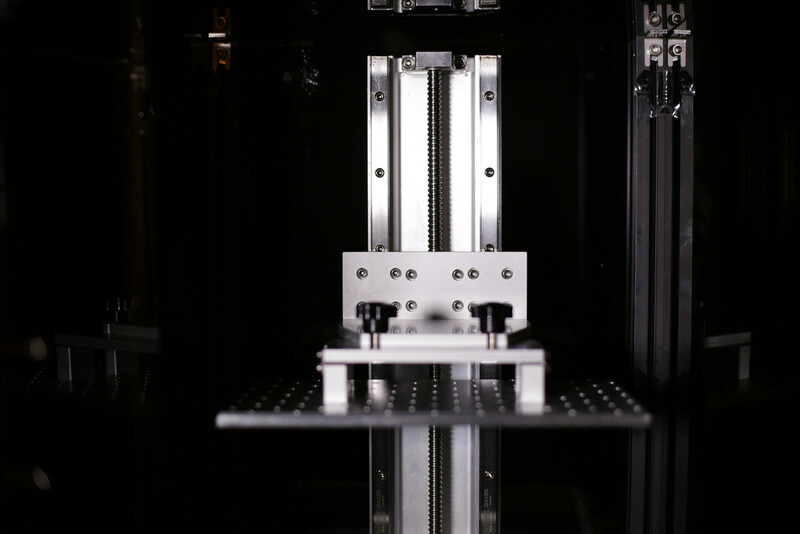 The Z-axis is equipped with a thick aluminum alloy structure and dual linear rails with ball screws, something you don’t typically find on a budget-priced resin 3D printer. The dual linear rails with ball screws is said to virtually eliminate any wobbling, while also allowing users to easily adjust the printer’s speed. Another intriguing attribute of the Phrozen Transform is the ParaLED Optical Engine that is used to reduce the emission angle of the light source to be parallel. Manufactured exclusively by the Phrozen team, this mechanism is intended to increase the efficiency of light penetration through the panel. “Here’s how the ParaLED Optical Engine works: the system’s LED array is the same size as the LCD panel. 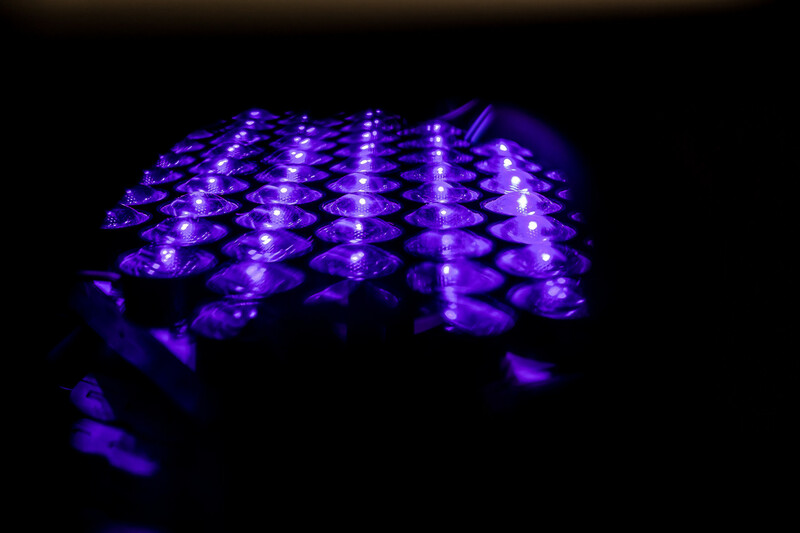 The light-delivery path is corrected to contract the emission angle of the LEDs, producing a near-parallel light source to enhance LED penetration through the LCD panel. This gives a uniform exposure for 95% of the surface area,” the Phrozen team writes on its Kickstarter campaign page. Phrozen TR250 – heat-resistant, low shrinkage and high hardness. It’s important to note that, as of now, the Phrozen Transform is still in the product development stage and has just crossed over the Kickstarter finish line. As you might be aware of, not all crowdfunding projects end up being actualized after the money rolls in, so there is some reason to hold reservations about this 3D printer. However, the Taiwanese manufacturer has already brought a number of successful 3D printers to the market, giving us a fair amount of faith that the Transform will soon be available to the masses. Phrozen Transform – Review the Specs Where to Buy? The manufacturer has just completed its highly successful Kickstarter campaign, and therefore, the Phrozen Transform is not yet available. However, we’ll be sure to update this article with information on where to buy this anticipated LCD 3D printer if and when it’s released onto the market. License: The text of "2019 Phrozen Transform – Review the Specs" by All3DP is licensed under a Creative Commons Attribution 4.0 International License.